With a unique mix of colors, found only in the heart of the natural Park of Arrábida and the Natural reserve of Sado Estuary. Most of the furniture from Casa d'Adôa dates from the early 20th century. Many of the pieces were made in craft workshops around the area or suffered restoration, thus recreating a homely and cozy time of our grandparents. 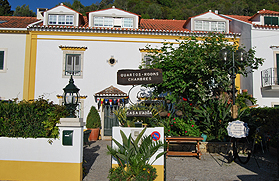 Casa d'Adôa is located in an area with lots of history in wine production, among others you can find three major wine producers, "José Maria da Fonseca, Ermelinda Freitas and Quinta da Bacalhôa." Apart from visits to wineries in the region, we have many other activities to offer you. 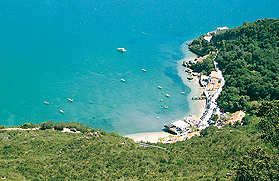 Placed in the beautiful bay of "Portinho da Arrábida", where the Sado River meets the Atlantic Ocean; it shows a unique mix of colors, only found in the heart of the Natural Park of Arrábida and the Natural reserve of Sado Estuary. With the sea only at 50 meters away, Casa d'Adôa with almost two centuries of existence is now recuperated and focuses on private tourism. Rooms, Apartments and Suites are equipped with all facilities to offer our clients, the best quality in each choice.